Old map by ADMIRALTY CHART. - Cape Verde Islands, St. Vincent, Porto Grande. . . Title: Cape Verde Islands, St. Vincent, Porto Grande. . . Size: 18.7 x 23.8 inches. Condition: In good condition, some marks and soiling to chart and margins, some paper creasing. Ink stamps. Printed on strong paper. 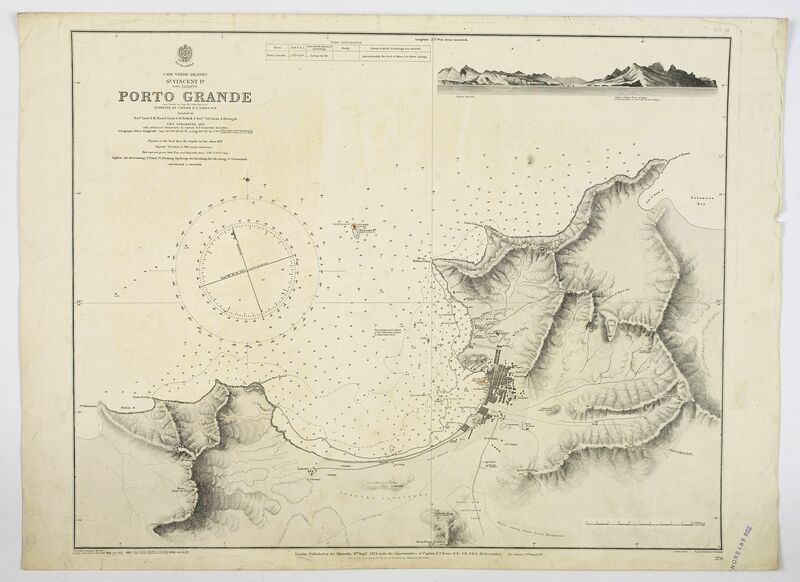 A large maritime chart of Porto Grand on the island of St. Vincent of the Cape Verde islands. The map has tremendous physical detail, plus the settlement of Mindello. The Porto Grande Bay is a natural harbour, with Mindello the main city of St. Vincent. With depth soundings in fathoms, a compass, and a view in upper right corner. With tidal information also. Shows the cricket ground, a golf course, rifle ranges, cemeteries and roads. First published in London by the Admiralty in 1874, this chart has regularly been updated until 1926.